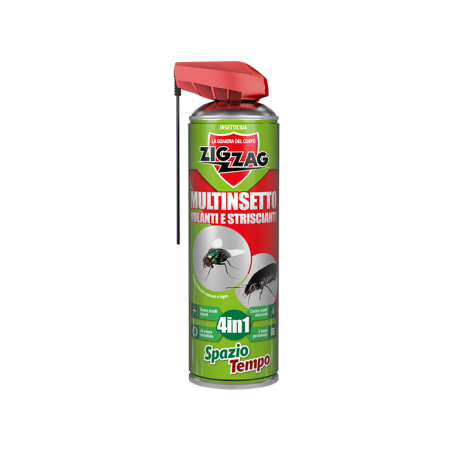 4 in 1: 1 - Acts against flies, mosquitoes, tiger mosquitoes and all flying insects; 2 - Acts instantly when sprayed in space; 3 - Acts against cockroaches, ants and other crawling insects; 4 - It acts in a residual manner, prolonged over time. All the effectiveness of an insecticide for flies and mosquitoes and of an insecticide for cockroaches and ants in a single product. It can also be used preventively on all the surfaces in the home, on door and window jambs, gratings, mosquito nets, curtains, walls and floors; on balconies and exteriors in general, loggias, verandas and gazebos with a barrier effect to keep insects away. Notes: A single product against both flying and crawling insects = SAVING. Fast action in space and long persistence in time: this means treating the environment less often = EVEN MORE SAVING and LESS POLLUTION. This product is also available in d 57.